Just as the enterprise takes another swing at figuring out how to help employees work better together, Facebook continues its push to entice companies to adopt its collaboration service. During the company's annual F8 developer conference in San Jose, Calif. yesterday, Facebook rolled out updates to its Workplace collaboration tool. "Here at Facebook, we've used Facebook to get work done for years," wrote Simon Cross, the product manager for Facebook's Workplace collaboration tool, in a blog post . "Soon, other companies were curious about how we used Facebook to work and scale, so we built a version of Facebook for work, to be used outside our company." Facebook released its collaboration tool in the fall of 2016 in an effort to tap into the lucrative enterprise market. Today, there are 14,000 organizations using Workplace in 77 different languages, according to the company. Collaboration tools -- including Microsoft's SharePoint and Cisco's Quad -- were big talking points about five years ago. There was a lot of talk about helping employees collaborate. Ezra Gottheil, an analyst with Technology Business Research, said business and IT managers simply didn't know what they wanted and many pushed the entire issue to the back burner, letting workers focus on instant messaging tools, like Slack. Now he sees companies coming back around to looking at adopting collaboration tools again. "We're seeing increasing interest in real-time collaboration and messaging," said Gottheil. "I think lots of companies are just now beginning to evaluate products. Slack has generated a lot of interest, but it hasn't locked up the market. Slack, and now Facebook and Google, are just building out from an instant messaging paradigm." The problem for many enterprises, according to Gottheil, is that companies have been cobbling together different tools -- like using IM and some document sharing -- and it's just not an efficient or easy-to-manage system. That might get some of the collaborative work done but it's not cohesive, and different enterprise departments might use different systems, meaning they can't all collaborate together. "Well, enterprises are realizing they are already using a bunch of ad-hoc collaboration tools, and they pose all the difficulties of ad-hoc stuff -- security, compliance, scale, interoperability," said Gottheil. Rob Enderle, an analyst with the Enderle Group, agrees that enterprises simply haven't come around to figuring out exactly what they need. "Let's be clear, the enterprise doesn't know what it needs; otherwise it would have already locked down on a solution," he said. What's bringing enterprises back to the idea of collaboration tools? Patrick Moorhead, an analyst with Moor Insights & Strategy, said, in large part, it's millennials. Younger workers, who have grown up with social networking, want to be able to easily connect with their coworkers. And that is good news for Facebook. In a market that's highlighted by the likes of Microsoft with Office 365 and Teams, Google with G Suite and Hangout Chat, Cisco with Spark and the upstart Slack, Facebook could well speak to millennials working in the enterprise. Younger workers grew up using Facebook to connect with their friends. Now is the time for Facebook to push for them to be able to use a very similar product in their workplace. While people have been using traditional Facebook at work for years, most have not been using it to get work done. Only a small percentage actually were using it connect work groups and share work information - as opposed to sharing pictures of their lunch order or their weekend fun. The social network wants to change that. Much like the traditional Facebook social net, the company's Workplace product has features like News Feed, Groups, Live chats, search and trending posts. The features help workers communicate in live chats or in Groups, while also connecting into meetings or office events via Facebook Live. 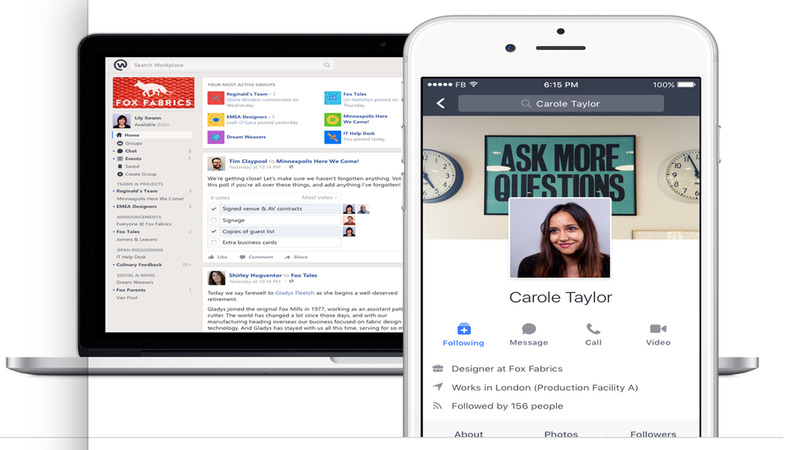 The new version of Facebook's Workplace uses a familiar interface to help users collaborate, the company says. Workplace, though, isn't just a direct copy of Facebook's social site. It also has an analytical dashboard and Multi-Company Groups, which lets people from different companies to work together. Now Facebook is updating its collaboration service by integrating enterprise services, like Office, Salesforce, OneDrive and Box. "Files, documents and CRM are a critical part of daily work life," wrote Facebook's Cross. "As Workplace becomes the primary place where people in organizations go to share information and have discussions, we needed to make working with these technologies fast and reliable for a better work experience. New integrations with some of the world's leading enterprise services make it easier to share, preview and organize files, documents and work with customer records." Facebook also is adding support for two-factor authentication to increase security, while also adding support for streaming Facebook Live into Workplace via Real-Time Messaging Protocol. Workplace also now allows companies to build custom applications with Bots. "Workplace customers can build custom bots for their organizations, that allow people to interact with other tools and services from within Workplace," wrote Cross. "People can interact with Workplace bots in groups as well as in chat. In groups, you can @mention a bot to initiate a task or workflow. The bot can take action and reply back with relevant information. In chat, you can message a bot to request information or take an action."